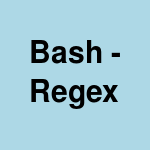 Bash built in double square brackets can be used for regex match in if condition. This can be pretty powerful and can be used in writing complex regex tests. Here are some examples. Here is a simple example to check if a url begins with /foo after the host part. Default match is case sensitive.